There are very few incidents of Sai Baba's earlier life that have been recorded, that too from the memory of people of Shirdi. The task becomes more difficult as Sai Baba visited Shirdi as a wandering Sufi Fakir and many were found all over India. People would hardly notice their presence Sufi Fakirs normally wander and have no single place to live. They are supposed to be dedicated to God, Allah or to the indivisible almighty, sacred and the one and only one divine energy. Not all Fakirs would have been totally dedicated to the divine and hence most would go unnoticed as just another Fakir. As soon as Sai Baba arrived in Shirdi with Chand Patil. Mhalsapati called Him, "Welcome Sai." None knows by which name He was called before. 'Sai Baba' were the words exclaimed by a village priest Mhalsaapati who noticed something divine in Him and welcomed him as Sai Baba. Sai is the word used for divine and Baba for Father or someone respectable, respectable from heart and love. The same Mhalsaapati who noticed the divine in a wandering Fakir and later was one of the closest to Sai Baba.Who even use to sleep in Masid Mai or Dwarkamai with Sai Baba. 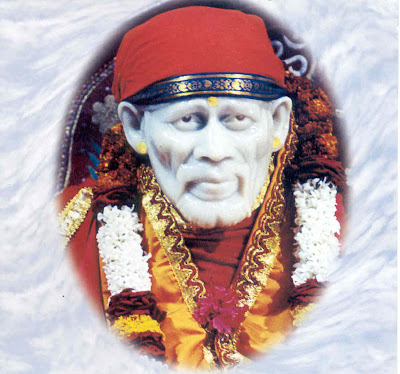 Who considered Sai Baba as Divine manifestation and worshiped him whole heatedly. 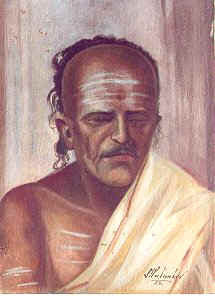 This Mhalsaapati was priest of local Khandoba temple of Hinduism. Sai Baba liked the sacred environment of the Temple and wanted to stay there. Mhalsaapati had not allowed Sai Baba to do the same as He was a Muslim Fakir and the social standards and peoples way of thinking would have created too many problems for the same. Baba said, "God is one for Hindu, Moslem and all, but you object to my entry, I shall go." Sai Baba moved to a margosa (Neem Neem) tree and would remain absorbed in divine contemplation for most of the time. The place called Gurusthaan is higly sacred and place for worship in Shirdi. Bhagat Mhalsapati had contact with Shri Sai Baba on very intimate terms. Due to some reason, Sai Baba who gave wealth to many did not give even a single penny to this close and intimate devotee Mahalsapati. 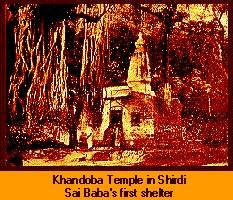 It was was not just Shri Sai Baba even his Istdevata (The form of God loved and worshiped by him) Khandoba also willed the same. Bhakt Mahalsapati was goldsmith by profession, but due to intense devotion towards the God he was unfit for this or any other profession for good material life. He had a piece of land which was not fertile and yielded nothing. This meant that Bhakt Mahalsapati surrendered to to Lord Khandoba and his Sadguru Sai Baba for the material requirements, leaving any kind of job for his material welfare. This pious soul passed away on Ekadashi. Thereis also a story that said that Mahalsapati actually postponed a day for leaving his body. 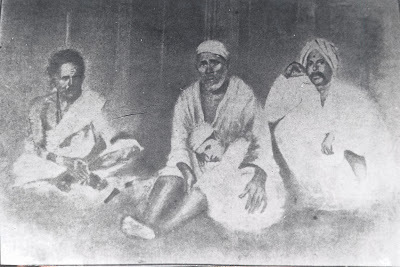 4th picture : One of the Original pictures of Sai Baba in which Sai Baba is seen sitting with Mhalsaapati (also spelt Mahalsapati), with his son on Sai Baba's lap. 5th picture : The idol of Lord Khandoba which Bhagat Mhalsapai used to worship. 6th picture : Entrance of Khandoba temple these days. It is on main road near the water tank.